B&O Play announced the Beoplay M5 at CES 2017 - a compact audio haven with stacks of performance in a very attractive £529 ($599) package. 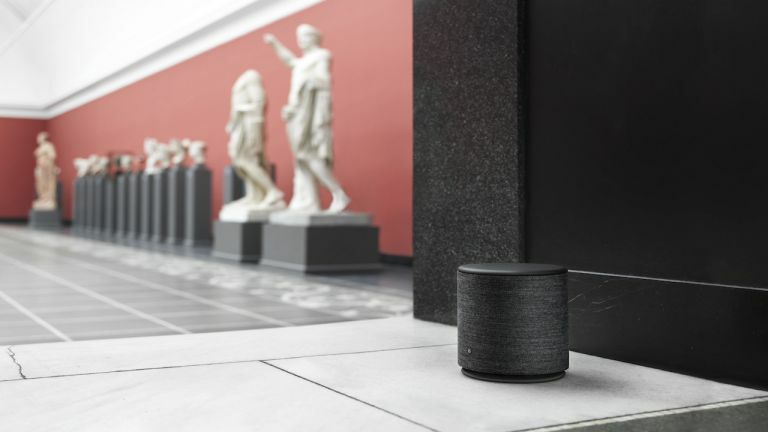 This is the first effort by the Danish manufacturer featuring a 360 degree speaker, meaning no matter where it’s positioned, you're going to be hearing the speaker to its full potential. Beoplay M5 can be fed music through every method imaginable - Bluetooth, Chromecast, AirPlay, Spotify Connect and the Beomusic app are all supported. What you’ll notice immediately is the wool-blend fabric coating and the fact that the outside has no visible buttons at all. The top of the device rotates, this acts as a way to adjust volume and if you press down on the top it acts as a pause and play button. You can’t really tell in these pictures, but the Beoplay M5 isn't as minute as it looks, the speaker measures up at 7.5 inches tall and 6.5 inches in diameter. A 5-inch, downward firing sub woofer, mid-range driver and three tweeters produce the powerful audio, while there's also the ability to link it up with other Beoplay devices for multi-room audio. We can't wait to test it out. Our editor had the pleasure of listening to it on the CES show floor, and while it sounded fantastic up close, we really need to try it in the home environment to try it out properly. The B&O app is also a convenient tool for adjusting the finer details of the speaker — you can tell the system if it’s in a corner or next to a wall and it will adjust its sound accordingly for the best performance.